On Jan. 19, over 200 people came out into the streets of Chicago during a winter storm warning — with a significant amount of snow, freezing temps and high winds — to protest the second anniversary of Trump’s inauguration. 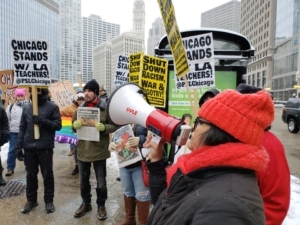 ANSWER Chicago called the protest so people could rally in solidarity with the Women’s marches against the racism, bigotry, and war-mongering of the Trump administration and the Washington establishment in a way that was independent of the major political parties. The protest began at noon at Wacker and Wabash, across the river from Trump Tower. ANSWER Chicago coordinator John Beacham began the event by declaring that the marchers were in solidarity with the striking Los Angeles teachers. He also condemned the ludicrously short sentence given to the killer cop Jason Van Dyke for the murder of Laquan Mcdonald. 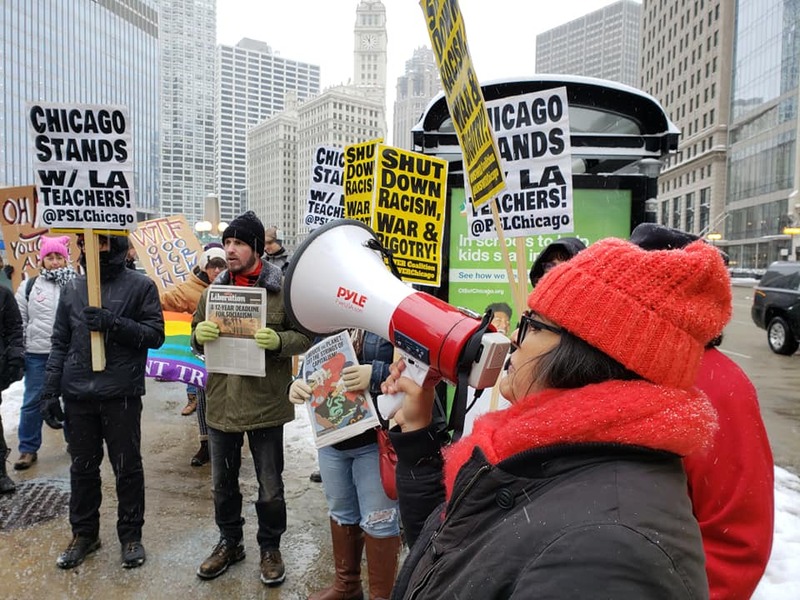 After several other speakers and chants, the protest began to march through downtown Chicago, ending at a plaza on LaSalle Street. Along the march, people on the street cheered on the banners and chants. Speakers from ANSWER Chicago, GABRIELA-Chicago, Gay Liberation Network, Refuse Fascism, Chicago Committee for Human Rights in the Philippines, LEAD OUT NOW! Chicago, and the Party for Socialism and Liberation spoke about why they were participating in the march. A common theme in all the speeches was the need to for working and oppressed people to take to the streets in order to achieve progressive change and oppose US imperialism. While the protest was smaller than previous years, the militant march during freezing conditions shows that a real resistance to Trump and the entire racist, exploitative system continues to exist and grow. Struggles across the country for justice are escalating; with LA teachers striking for better working conditions and schools, the Black community in Chicago marching against racist police violence, and furloughed federal workers doing all they can to survive without a paycheck. The need to build a movement that not only unites and strengthens these struggles, but combines it with a call for the US to stop the aggression against Russia, China, Iran, Venezuela, and all the countries in its cross-hairs is of vital importance.